The Star Wars films are no strangers to featuring cameo roles. Richard Marquand, the director of Return of the Jedi snuck his voice in on a robot, George Lucas and several of his children could be seen in the prequel films and Treat Williams had a quick turn as a Stormtrooper in the Hoth scenes in Empire. You get the gist! J Abram's is well known for his use of cameos and putting Easter egg like references in his films so why not for TFA? Let's start with what we think is the biggest cameo. Both Ewan Macgregor and Alec Guiness each feature in the same single line that can be heard during Rey's encounter with Luke's lightsaber. Alec does the 'Rey' part and Macgregor does the 'there are your first steps'. Here's how they managed this trick. The second one is what we consider the coolest cameo ever in the Star Wars films. 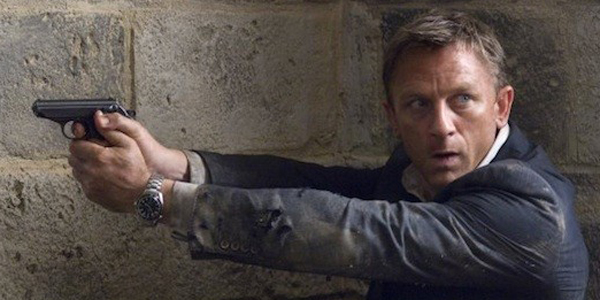 Daniel Craig who is better known to a gabillion movie fans as James Bond was the Stormtrooper that fell under Rey's spell when she tried her Jedi mind trick on him to request her release. It's a very funny and quotable exchange between the two. JJ Abram cast his good friend Greg Grunberg in the film as Snap Wexley. He had a line at the resistance base and featured in the X-wing attack on the Star Killer Base. Grunberg did a cameo for JJ in the first episode of the TV show Lost as the pilot of the plane that crashed and had a quick turn in Mission Impossible III. He's of course best known for his role in Heroes. JJ cast his father Gerry in a very small cameo as Captain Cypress. Gerry has played bit parts in several of JJ's productions. The doctor that tends to Chewbacca's arm wound would have been well known to British Star Wars fans as she was played by Dame Harriet Walter, a renowned stage and screen actress. Her character was called Dr. Kalonia. There's a nice piece of symmetry here in that her uncle was Christoper Lee who played Count Dooku in two Star Wars films. Simon Pegg plays Unkar Plutt. You wouldn't know it by looking at him or even listening to him! Pegg previously played a role in JJ Abram's Mission Impossible film and formed such a strong working relationship that JJ cast him as Scottie in the Star Trek movies. Do you remember the Ewok known as Wicket? Famously played by a very young Warwick Davis, he returns as an alien called Wollivan that can be spied having a drink at Maz Kanata's bar. Davis charmed Lucas so much that he later featured in Lucas' Willow film. He also had a wee cameo in The Phantom Menace as well! Nigel Godrich, a well known music producer famous for his work with the band Radiohead, had a quick turn as a Stormtrooper. He Stormtrooper number is FN-9330. Yoda puppeter Frank Oz (and the voice of Miss Piggy!) recorded new lines of dialog for the flashback sequence but ultimately pre-recorded Yoda material was used. Billie Lourd, who is Carrie Fisher's daughter was seen wearing Princess Leia style buns as Lieutenant Connix. JJ Abrams has a long term working relationship with music composer Michael Giacchino. Given that John Williams has a firm hand on the teller when it comes to creating Star Wars music, Giacchino had to make do donning a Stormtrooper suit as FN-3181. He's the trooper who puts the captured Poe Dameron before Kylo Ren at the film's start. Judah Friedlander can be briefly spied as a bar patron at Maz's Castle. If you think back to the Han solo frieghter scene, Kanjaklub leader Tasu Leech is played by Yayan Ruhian, and Iko Uwais plays Razoo Quin-Fee. They are well known for their athletic roles in the two Raid films. There's a strong run of actors who performed roles in the Game of Thrones, this is because the casting director for that show also did the casting for The Force Awakens. Gwendoline Christie is the major player as Captain Phasma but did you spot Thomas Brodie-Sangster of The Maze Runner and Game of Thrones plays a First Order officer. Jessica Henwick who was featured in season 6 of Game of Thrones played X-Wing pilot Jess Testor. Mark Stanley was a Knight of Ren. Miltos Yerolemou who played Arya’s doomed fencing instructor Syrio Forel, is a bar fly in Maz Kanata’s bar and Emun Elliott had a crack as well as an X-wing pilot. Morgan Dameron who's last name was part of the inspiration for the name of Poe Dameron's character has a turn as a Resistance officer named Commodore Meta. That's a pretty clever in joke!